Although at first it s location was very noisy - the ambiance of the place and friendliness of staff soon overcame this . The location is great near the river and train station Would stay again definitely. The receptionist can speak English, which I liked. And he was helpful and available to answer any of my questions. The only problem is the hotel is a little far from center downtown area. Quaint bed and breakfast in a nice neighbourhood in Bangkok. Close to the skytrain. Cleanest place we stayed over the course of 3 weeks. Very friendly staff, room descent ok, spacious, balcony, great for sleeping. Location very good, nearby BTS Ekkamai. Place is accessible to Sky train station, clean rooms. staffs are very friendly and considerate. Why Stay at a B&B in Bangkok? If you want to find a place to stay with fewer rooms than a hotel and an intimate environment, a bed and breakfast might be the perfect option for your getaway to Bangkok. Bangkok has 2882 accommodations, including 16 B&Bs, so you'll have plenty of options to maximize comfort and relaxation. During your time in Bangkok, Odeon Circle and Wat Pho are some top monuments worth a visit if you enjoy exploring a destination through its sights and attractions. 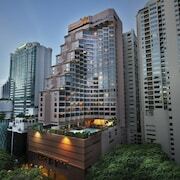 Travelers who want to experience Bangkok should check out its temples and major shopping area. If you're looking to find something to do during your travels, you might consider checking out Sea Life Bangkok Ocean World and Queen Saovabha Memorial Institute. You might put Odeon Circle and Temple of the Emerald Buddha on your list if you want to see more of the area. Fly into Bangkok (DMK-Don Mueang Intl. ), which is located 12.7 mi (20.5 km) from the heart of the city. Otherwise, you can search for flights to Bangkok (BKK-Suvarnabhumi Intl. ), which is 14.9 mi (24.1 km) away. Nearby metro stations include Siam BTS Station, Rachathewi BTS Station, and National Stadium BTS Station. If you'd like to explore more of the area, hop aboard a train from Bangkok Makkasan Station, Yommarat, or Bangkok Hua Lamphong Station.